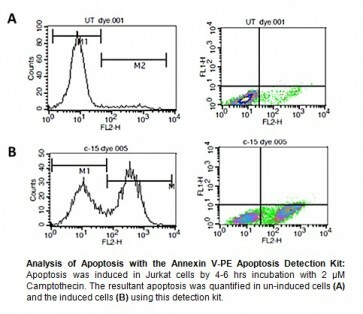 Annexin V-PE Apoptosis Detection Kit | K128 | BioVision, Inc.
• The Annexin V-PE Apoptosis Detection Kit contains the bright orange-red PE fluorescent probe that can be easily detected. 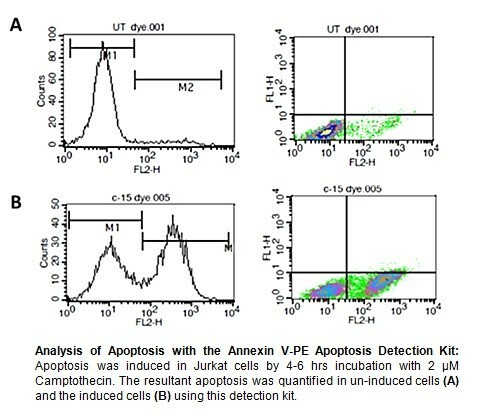 The Annexin V-PE Apoptosis Detection Kit is based on the observation that soon after initiating apoptosis, most cell types translocate the membrane phospholipid phosphatidylserine (PS) from the inner face of the plasma membrane to the cell surface. Once on the cell surface, PS can be easily detected by staining with a fluorescent conjugate of Annexin V, a protein that has a strong natural affinity for PS. The one-step staining procedure takes only 10 minutes. In addition, the assay can be directly performed on • Live cells, without the need for fixation. Can I do labeling with another antibody post Annexin-V labeling? If I permeabilize after fixation and do another antibody labeling then my annexin staining disappears. Does this have to do with the fluorophore or the permeabilization step? Double labeling of annexin V with a cell surface marker has been widely used successfully. It is important to remember that Annexin V staining is calcium dependent,. Therefore all buffers used after Annexin V stainig step should contain 1.8-2mM Ca+2. Fluorescence can also fade overtime, so it's better to perform the subsequent labeling steps in dark. Can the incubation with Annexin V be extended for 30 m in at RT? The incubation time can be extended to 30 min. However, a longer incubation period can sometimes result in more dead cells, which can give false positive results. Generally the incubation time should be limited to 10 min. After incubation, you can put the cells on ice if you need to wait a while to do the next step. I am interested in the kit for high throuphput screening. Can we use a plate reader to detect Annexin V? Plate reader will not help you in differentiating apoptotic cells from dead cells. The annexin V is a recombinant protein expressed from E. coli. 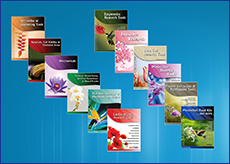 The kit has been standardized for mammalian cells only. Tanaka et al., miR-27 is associated with chemoresistance in esophageal cancer through transformation of normal fibroblasts to cancer-associated fibroblasts. Carcinogenesis, Aug 2015; 36: 894 - 903. Saloura et al., WHSC1 Promotes Oncogenesis through Regulation of NIMA-Related Kinase-7 in Squamous Cell Carcinoma of the Head and Neck. Mol. Cancer Res., Feb 2015; 13: 293 - 304. Li et al., Phosphorylation of Merkel Cell Polyomavirus Large Tumor Antigen at Serine 816 by ATM Kinase Induces Apoptosis in Host Cells. J. Biol. Chem., Jan 2015; 290: 1874 - 1884. SALMA ESSA et al., Signature of VDR miRNAs and Epigenetic Modulation of Vitamin D Signaling in Melanoma Cell Lines Anticancer Res, Jan 2012; 32: 383 - 389. Julia L. Cook, et. al. Expression of a naturally occurring angiotensin AT1 receptor cleavage fragment elicits caspase-activation and apoptosis. Am J Physiol Cell Physiol, Nov 2011; 301: C1175 - C1185.